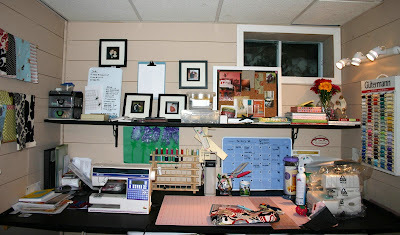 It's nothing fancy but this is where I spend a lot of my evenings sewing bags and other accessories for Designs by Lulubelle. Ideally, I'd love to have a true studio space, but I've carved out a pretty decent piece of real estate in my basement/playroom. I'm able to hang various fabric combinations on the wall rods and have surrounded myself with my own little bits of inspiration (my children's artwork). As you can see in the photos, my serger is still in its original packaging. One of my many "goals" for the year is to learn to use my serger successfully. After finishing up a busy holiday season of custom work, I've spent the last few weeks drafting (and redrafting) new patterns, researching new fabric lines, and trying to define what I'd like to accomplish this year business-wise. My hopes are to have a few new ideas off paper and in my Etsy shop in the next couple of weeks. Thank you for taking the time to see where I work. Love the flowers - such a nice touch. I've tried fresh flowers in my studio, but I always manage to knock them over. 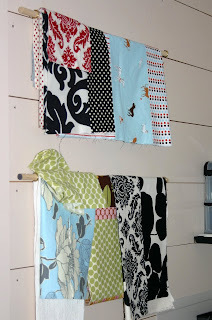 I think the rods to hang fabric are an awesome idea!